"I am convinced that the job of the JAAA executive, most of them, is to try sabotage me and the success that I have with my athletes." - MVP Track Club coach Stephen Francis. Jamaica is in disarray, as they are considering banning Asafa Powell, Melaine Walker (2008 Olympic champ), Shelly-Ann Fraser (2008 Olympic champ), Shericka Williams (Olympic silver medalist) and Brigitte Foster-Hylton (World Championships medalist) from competing in Berlin for not attending a mandatory training camp. Meanwhile, JADCO is appealing their own decision to let the 5 athletes who tested positive at the Jamaican Trials free, which will take sub-10 teenager Yohan Blake and 4 x 100m team member Sherri-Ann Brooks out of the Worlds team as well. Women's Steeple - Medal For Barringer? Women's High Jump - Can Vlasic Win Big One? LRC: Worlds Events By Day Get an idea of the schedule of Worlds and don't miss your favorite events. We've got all our event previews here as well as television and internet coverage schedules. Hope you find it useful. *Amazing News: Olympic Champions Fraser And Walker Plus ASAFA POWELL May Be Banned From Berlin For Skipping Camp That's correct - as of now, Asafa Powell and 4 other WC or Olympic medalists from MVP training group will be banned for not showing at camp. One Jamaican Paper Says All Jamaicans Cleared Of Doping Allegations LRC told you back on July 27th that "we think it's going to be a non-story" and yet again it looks like we were right. *Interesting Read: Performance analysis: A weapon against doping? 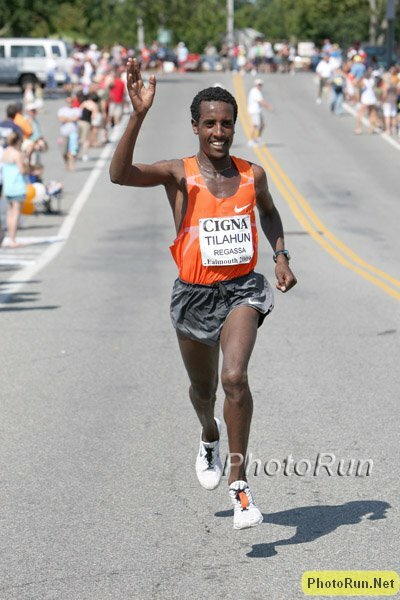 *Men: Teen Phenom Tilahun Regassa Dominates *Victah Sailer Photos Of Regassa Smiling And Waving During Amazing Effort The 19-year-old who put on a show at Bolder Boulder did it again in Falmouth. He ran a 4:22 1st mile and the others let him go, thinking it was a rookie mistake. By 3 miles, Regassa was already celebrating. American Meb Keflezighi was 5th. Tyson Gay: "You have got to run 9.59 to beat (Bolt) ... I have the mechanics. I have the coaching. It's all there." *Lee Evans Not Promising Miracles For Nigeria, But We're Sure He's Happy To Be Coaching In Africa Where There is Real Freedom Not "Fake Freedom" Like In America The fake freedom quote comes from his Wikipedia page. *Women Offer Weakened British Squad Best Chances For Berlin Success Injuries have ravaged the Brits. *Kenyan Sprinter Excited To Be Going To Worlds The 400-meter runner will be going outside of Africa for the first time. She made the squad after another sprinter tested positive. 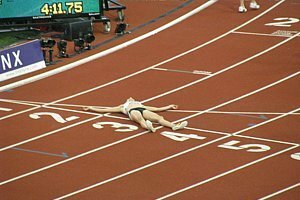 *400h World Record Holder Yuliya Pechenkina Pulls Out With Sinusitis She missed the Olympics for the same reason last year. Cottbus Recap: Tyson Gay Rests, US Women Run 8th Fastest 4 x 100 (41.58), US Men 37.85 That pretty much is it in terms of track action until next week's World Champs which start on Saturday. Drug Cheat Katerina Thanou Rejects IOC Offer To Get 2000 Olympic Gold Medal A new rule needs to be put on the books. Once convicted of a drug crime, everything you did before that is wiped off the books. Why assume the person was clean then? World And Olympic 400m Champ Christine Ohuruogu Speaks Out Against Critics In Advance Of 2009 Worlds She has left with 2 golds the last 2 years without running fast before the global champs. 54.31 For Vessey In Final Berlin Race Tuneup Back and forth on flights from Europe, 54 isn't half bad. Video Interview With Cal's James Brewer After His 3:54.8 At Crystal Palace His first time under 4:00 in the mile was a 3:54. Meb K Blogs On Overcoming Heartbreak And Hip-Break Over The Past 2 Years Keflezighi fractured his hip while running the Olympic Trials Marathon last year and it has been a long road coming back. He'll race Falmouth on Sunday. Beloved Bucknell Coach Art Gulden Leads 2009 Inductees Into USTFCCCA Hall Of Fame Talk to any Bucknell alum who ran under Coach Gulden and you'll quickly realize how important this man was in many people's lives. Link To An Amazing Indie Film Called "My Run" You can watch the trailer and read the story of a man who, after the death of his wife left him alone with three boys, was determined to run 75 marathons in 75 days to reach the Atlanta Olympics. 75,000 To Run Sydney's 14k City To Surf, World's Largest Fun Run 75,000 people running to the beach in Sydney. Sounds like a good party. Oregon Bidding To Host NCAAs From 2013 To 2017 No one puts on a meet like Eugene but having every big meet there is going to kill Eugene enthusiasm's for track. The only positive will be it will help Oregon's recruiting. LetsRun.com's Week That Was We start off with news regarding the world's best milers - Alan Webb, Asbel Kiprop and German Fernandez - head to some Kenyan semantics and finish with a look at the drug fiasco currently unfolding in Jamaica. It's our last "Week That Was" before the World Championships, so enjoy it while you ponder Bolt vs. Gay and the rest of the upcoming WC rivalries. LRC: Women's 800m Preview Get our take on Maggie Vessey's chances against a fascinating field including Pamela Jelimo, the Russians, and Caster Semenya. LRC: Men's Shot Put Preview The Men's Shot happens on the first day. The last call for Adam Nelson? Can American Big 4 take down Olympic champ Majewski? LRC: Women's 1,500m Preview Anna Willard and Americans get a big opportunity for a medal. Luz Long & Jesse Owens Showed In Berlin What Humanity (And Sports) Can Be The German Long died in the war, but not before he wrote a letter urging someone to introduce his son to Owens. His son and Owens' granddaughter will hand out medals in 2009. *Kenyans Sure Not To Miss Last Chance To Talk Big Talk They are going to have a tough battle on their hands in every event for medals. *Amazing Story Of First International Kenyan Sprinter Since 1984 Joyce Zakary, Kenyan 400m runner: "It was my first time outside Kenya. I had never raced against such heavily built athletes; they frightened me. Now that I'm in the Kenya team to the World Championship, I feel so happy." *Praise For Britain's Blossoming Star Heptathlete Jessica Ennis Van Commenee's Gold Medal Hope #1. *Phillips Idowu Keeping Medal Pressure Off Himself Van Commenee's Gold Medal Hope #2. And that's basically it for Britain. *Robert Mwafrika Cheruiyot Talks Like He's Ready For Berlin 4-time Boston champ Cheruiyot is back from injury and hoping to regain his old form in Berlin. *J-Bear Ran 2:02 While American 4 x 100m Sprinters Cheered Her On Jenny Barringer is one of several US distance runners with a chance at a medal. *Bobby Kersee Has Allyson Felix Feeling Great Heading To Worlds 21.88 in Stockholm has Felix feeling golden like she was when she got 3 in 2007. *Bad News! Jenn S Out Of Worlds We've been wondering what's up with Jenn S, but turns out an Achilles injury has brought her down. Too bad, because Isinbayeva is beatable this year. *Smart: Gay Sat Out Cottbus Relay Practice Read our 200m preview and watch Tyson Gay smoking Usain Bolt 2 years ago. *Jamaican Press Release On The Not-Guilty Verdict On 5 Positive Drug Tests Some good news for Jamaicans: the Jamaican panel let their sprinters off with no punishment. Good news for everyone else? *Amazing News: Olympic Champions Fraser and Walker Plus ASAFA POWELL May Be Banned From Berlin For Skipping Camp Uh oh. Asafa Powell has been racing like he would rather be at home, but the women that would be banned are Olympic gold and world medal winners. 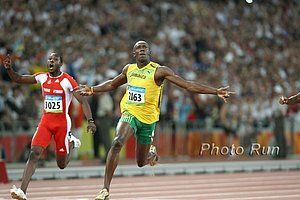 *Bolt: "The 100m should be all right, but the 200m will be more challenging if I don't get into the shape I want to be." So he ran 19.59 into a headwind in the rain while he was not in shape. Non-Worlds Track And Field News Click Here Worlds are officially taking over the home page. Recommend Read: With Russian Drug Cheats On Sidelines For Worlds, Britain's Lisa Dobriskey Has Chance To Medal "Ah, the dark clouds of the Russian drug cheats coming in from the middle distance." *After Falling In Beijing, Spain's Marta Domínguez Enters Worlds As World Leader In Steeple She is a 2-time silver medallist at 5k. 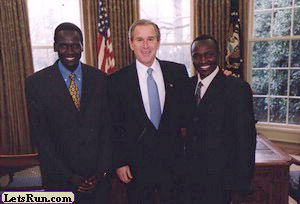 *Ezekiel Kemboi Is Tired Of Silver At Worlds The 2004 Olympic champ has been the runner-up the last 3 times at Worlds. After running a PR of 7:58 in May, his 2009 season has been less than stellar and he may struggle just to medal. He's the one that famously said he wouldn't return to Kenya if he didn't win gold last year. Wanna Have Diner With Ryan Hall & Deena Kastor Next Sunday? Bid here. London Marathon Champ Irina Mikitenko Out Of Worlds Mikitenko was the heavy favorite (assuming Paula doesn't run), but the death of her father prevented her from training properly. Asbel Kiprop Trying To Get Kenya Its First World Championship 1,500m Gold Medal Hard to believe, but a Kenyan or an Ethiopian has never won a World Championships gold medal at 1,500m. Alistair Cragg Now Part Of Terrence Mahon Group Ready For Worlds Cragg ran 8:37 and 13:16 early in the year but has struggled of late. *Natalya Dobrynska Blogs For IAAF We think her blog is usually pretty good. *Another Good Jessica Ennis Article From The UK As the Great Britain team keeps losing their stars to injury, the pressure seems to mount on 5'4" heptathlete Jessica Ennis to live up to her World #1 spot. Newest Endurance-Enhancing Craze Set To Begin: Go Buy Beetroot Juice! Actually, we're going to the health food store right now. Right after Taco Bell. China May Not Get A Single Medal In Berlin Injuries to former world medalists Liu Xiang and Zhou Chunxiu severely limit China's chances at medaling. Many Chinese youngsters will get their first shot at Worlds. *BBC Sports And Discovery Special On DDR Doping In 1980s We've heard that the average American does 12 minutes of actual work a day, or something like that. So you should have plenty of time to listen to this BBC World special. *Mike Hurst Reminds Us To Take A Second Look At Jamaican Scandal And History The first helpful analysis we've seen of the drug fiasco down in Jamaica. Sure, it looks like it's no big deal, but so did BALCO at first. *Random Drug Tests In Brazil Nab At Least 6 For EPO And Other Drugs There are 44 in the camp. We're presuming they didn't test everyone. So 6 positives speaks volumes. *Marion Jones' Film Producer Feels For The Fallen Star He wrote and directed Boyz in da Hood. *NBA Gets In The Mix With First High Profile Suspension! We heard guys on the radio saying they never thought NBA players would be taking 'roids. LRC: The Week That Was This week's version of The Week That Was is officially dedicated to the 800 meters and Maggie Vessey. We look at 800 greats past, present and possibly future as we say goodbye to one legend and introduce another. Along the way, we also give you proof as to why German Fernandez shouldn't contemplate going pro and try to avoid ignoring Lopez Lomong. We also give out free of charge the LetsRun.com Proposal To Save All Sports.